The History Files underwent a large-scale style refurbishment between 2007-2008 which resulted in the general layout standards that are still employed today. Since then there has been an ongoing process of updating and improving the site's general presentation and organisation. 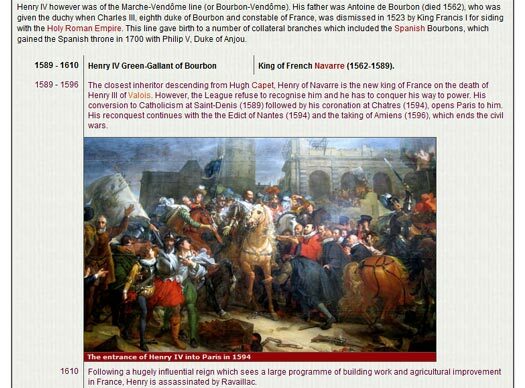 The site's front page changes every few years to keep that fresh, while the king lists are still being expanded, section by section, to meet the 2012 standards for a detailed timeline history that were established when the pages for the Celtic tribes of Gaul were being researched and written. The latest style changes in 2019 are the result of making the site mobile-friendly. That's not been an easy task with a site of 2,200+ pages (Jan 2019), but Google's search index has finally made it a demand that cannot be ignored. The king lists have been around for many years now. While the format hasn't changed particularly, the appearance of the lists have, so this page offers a brief guide to making the most of the data on each page. 1. The primary or earliest place name or state name along with an introduction. 2. A sizable gap here, indicated by the space between the introduction and the start of the vertical 'timebar' line, indicates a gap in knowledge between the known or probable beginnings of the state and history's first information about it. 3. 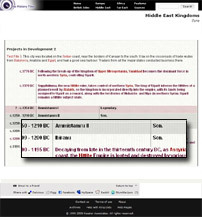 The name of the first ruler (usually in black unless otherwise indicated) or the first available background information or major events (in plum). 4. A break in the vertical 'timebar' line indicates a gap in our knowledge regarding events or rulers within the state. 5. All links become underlined when you hold your mouse pointer over them in order to make them more obvious. 6. Joint rulers or regents are shown inset from the timebar line with a small shaded bar before their name. 7. Important relatives who never reigned, or individuals who made a bid for power or who upheld a rival claim to a throne, are shown with a shaded backing. 8. Rulers who are usually known through sources that were written down several centuries after the event, and who are usually considered to be legendary or semi-mythical at best because there is no practical way of proving their existence, are usually shown with a pink backing. Alternative (and quite possibly conflicting) data from different sources is often shown in another text colour, such as green, red or grey. 9. 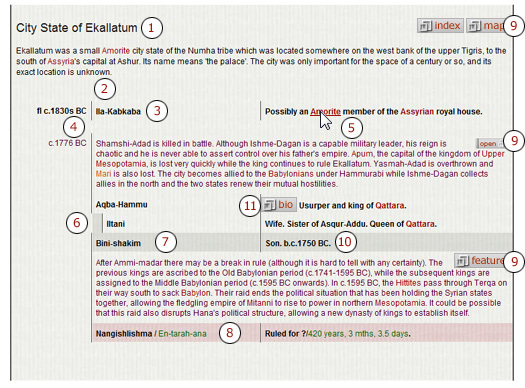 Buttons to the right-hand side of the text offer links to relevant features (showing 'Feature' on the button), maps ('Map'), special indices ('Index'). Another button type which is fast being withdrawn from use is the 'Open' button. These open (opened) pop-up windows with extra information, but the advent of mobile browsing has made this method unwelcome. Instead direct links are being offered which lead to new windows that contain the same information as before. Please note that no style is exclusive. There may be slight variations of usage throughout the site to fit in with regional differences or unusual circumstances. In the appropriate places, pictures are included in some lists. The styling is the same as for feature pages, and will always include an information bar at the bottom of the insert. Notice in the sample below how the picture remains linked to the vertical 'timeline' bar with no gaps above or below, showing that there is no break in the records for this state.